Peppermint essential oil is a cooling and soothing essential oil that has many health benefits. You can use the antimicrobial and antispasmodic properties of peppermint oil to relieve digestive complaints, get rid of cold symptoms, boost hair growth, and treat toothache. Peppermint oil is also good to rub on sore joints to help relieve pain and inflammation. There are many different ways that you can use peppermint oil for its health benefits. Peppermint oil can be used with a carrier oil to apply topically. Or, you can put a few drops of peppermint essential oil to use in your diffuser for inhalation. For digestive complaints, you can buy peppermint oil capsules to help relieve stomach upset and excess gas. In this article, you will learn about what science says as to the many uses of peppermint oil. You will also find practical ways to use peppermint oil for headaches, respiratory infections, improved performance, and better cognitive function. What Is Peppermint Oil (Peppermint Essential Oil)? Peppermint essential oil is an antimicrobial oil that is extracted by distillation from the leaves and flowers of the Mentha x piperita plant (Peppermint). Many people describe the taste of peppermint oil as a sharp minty, cool taste that refreshes your mouth. Spearmint has a milder taste to peppermint as there is less menthol in the plant. The difference between peppermint extract and peppermint oil is that peppermint extract is usually obtained in an alcohol solution and is not as concentrated as peppermint essential oil. Peppermint oil is a commonly-used essential oil that has many uses as an antibacterial, antifungal, antispasmodic and pain-relieving remedy. Let’s look in more detail at the many peppermint oil uses and why peppermint oil is good for treating many health issues. The antispasmodic and carminative properties of peppermint essential oil mean that it is good to alleviate problems with your digestion. To help relieve excess gas, digestive spasms, or abdominal discomfort, you can add one or two drops of food grade peppermint oil to your herbal tea. If peppermint tea causes you some stomach upset, then you can learn about what other herbal teas you can use to boost your digestive health. Using peppermint essential oil to treat symptoms associated with IBS is one of the most common uses for peppermint oil. If you want to get relief from symptoms of IBS, you should take peppermint essential oil capsules rather than drinking peppermint tea. Peppermint oil for IBS is sold in capsules that dissolve in your small intestine. Usually, you should take 50 mg peppermint oil pills with each meal to prevent digestive issues after eating. Apart from using peppermint oil for improving your digestion, you can learn about many other natural remedies for IBS. The carminative properties of peppermint essential oil can help to soothe your gastrointestinal tract to reduce feelings of wanting to throw up. If you feel as if you want to throw up or have motion sickness, you can put a few drops of peppermint oil on a tissue and inhale the vapors. Another way to get the anti-nausea benefits of peppermint oil is to put a few drops in your diffuser. Breathing in the pleasant aroma of peppermint oil will not only calm your stomach but also calm your nerves. Find out what other natural remedies are good for helping to reduce feelings of nausea. If you suffer from flatulence and abdominal bloating after eating, you can use peppermint essential oil to soothe your digestion. Other remedies for gas and bloating include consuming ginger, chamomile tea, or probiotics. Peppermint essential oil is good for pain, especially headache pain. Its cooling and analgesic effect mean that peppermint oil helps to treat pounding, stress-related headaches and migraines. Mix 2 or 3 drops of peppermint essential oil in a tablespoon of carrier oil such as olive oil. For headache relief, you should massage a few drops of the peppermint oil mix into your temples. You can also rub some peppermint oil on your forehead or behind your ears to ease your headache quickly. Learn more about the top causes of headache and how to treat headaches and migraines. You can help get rid of sore muscles or relieve pain in inflamed joints by massaging peppermint essential oil into your painful areas. Pure peppermint essential oil might be too concentrated to apply directly to your skin. So, you should mix it with a carrier oil like coconut oil or sweet almond oil. But it’s worth mentioning that in the above study about neuralgia, the researchers used neat (undiluted) peppermint oil. Make a coconut oil and peppermint oil pain-relief ointment by mixing 6 drops of peppermint oil with 2 tablespoons of warmed coconut oil. Massage the oil into the affected painful areas 2 or 3 times a day. Another way to relieve muscle and joint pain is to add a few drops of peppermint essential oil to your bath. Fill your bathtub with warm water and add 1-2 cups of Epsom salt and 20 drops of peppermint oil diluted in 2 oz (60 ml) carrier oil. Soak for up to 20 minutes to help relieve sore muscles and stiff joints. Find out what other essential oils are effective for pain relief. If you have a stuffy nose and upper respiratory infection, the effects of menthol in peppermint essential oil can help to unblock your airways. Make your own homemade peppermint oil vapor rub by combining 3 drops of peppermint essential oil, 3 drops of eucalyptus oil, and a tablespoon of coconut oil or other carrier oil. Rub the peppermint mixture into your chest to let the vapors loosen phlegm in your nose and chest. You can also try adding 20 drops of peppermint oil diluted in 2 oz (60 ml) carrier oil to your bath to help you breathe easier and relax your muscles. There are also many other natural remedies for chest congestion that can help to improve your symptoms of a chest infection. You could try inhaling peppermint essential oil to help relieve cold or flu-like symptoms due to its antimicrobial properties. 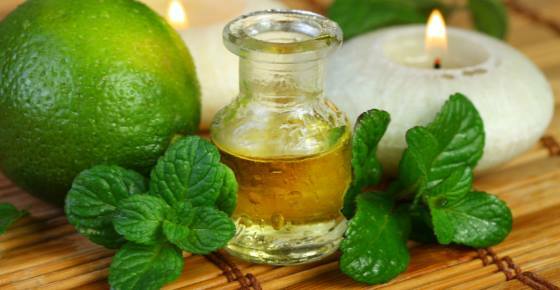 Researchers say that menthol from peppermint oil contains antibacterial and antiviral properties. Find out about more essential oils that can help treat your cold-related symptoms. If you suffer from conditions that cause your skin to itch, applying peppermint essential oil can cool inflammation and reduce the urge to scratch. The cooling effect of peppermint oil can also help reduce itching if you are pregnant. One clinical trial involving 96 pregnant women found that a natural remedy containing sesame oil and 0.5% peppermint oil had a significant effect in reducing the severity of skin itching. Make your own anti-itch cream at home by adding 3 or 4 drops of peppermint oil to a tablespoon of carrier oil such as sweet almond oil. Massage the oil into your itchy skin twice a day. Continue using to help manage symptoms of pruritus. Learn about reasons why you could have skin itching all over your body and what you can do to remedy the itchy sensation. Compounds in peppermint essential oil can stimulate your hair follicles and encourage hair to grow faster. For a daily massage to stimulate new hair growth, add two drops of peppermint oil to one tablespoon of carrier oil such as jojoba oil or coconut oil. Rub it into the scalp and leave for at least 30 minutes (it is a good idea to do a test on a small skin patch to make sure you don’t develop any skin irritation). Make sure the oil mixture doesn’t reach your eyes. If you suffer from pain before or during menstruation, then taking peppermint essential oil extracts can help you deal with abdominal cramping. The women took peppermint oil capsules for menstrual pain relief 3 times a day at the start of menstruation. If you frequently have cramping before your period, learn about other natural methods to alleviate menstrual cramps. One of the many benefits of pure peppermint essential oil is that its antioxidant properties help improve cognitive function and protect against the effects of aging. Keep a peppermint oil in your home diffuser to benefit from the brain-boosting properties of peppermint. You could also try some of these foods and herbs that have been proven to help improve brain function. You can use peppermint essential oil to boost your mental focus and prevent concentration problems. You may find it useful to rub some peppermint essential oil mixed with a carrier oil on your temples to help improve your concentration levels. As well as having a positive effect on your mental endurance, menthol in peppermint essential oil helps to increase exercise performance. You can drink peppermint oil by putting one 1 drop of food grade peppermint essential oil in 500 ml of water. Shake well, and drink the peppermint drink every morning to improve your performance. There may be reasons why you feel tired all the time. Learn about what you can eat to combat fatigue and boost your energy. The analgesic properties of pure peppermint essential oil are also good for soothing pain caused by toothache. Because peppermint has a cooling effect on skin and gums, the oil can also help to numb the pain if you put a drop of peppermint essential oil on a cotton bud and apply to your sore tooth. Find out other natural remedies for toothache. Peppermint essential oil is a common ingredient in many dental products because it helps to freshen breath and kill off plaque-causing bacteria. Compounds in peppermint oil such as menthol, menthyl acetate, and menthofuran have therapeutic properties that improve dental health. You can make your own bacteria-removing mouthwash by combining a few essential oils, including using peppermint oil. In a cup of water, add 2 teaspoons of echinacea tincture, 2 drops of thyme oil, and 3 drops of peppermint oil (use food grade essential oils). Swish the peppermint mouthwash around your mouth to kill off bacteria and reduce gum inflammation. Spit out. You can also try these natural remedies to remove plaque. Tick spray for humans: You can make an all-natural tick repellent using peppermint essential oil. In a 8oz. spray bottle filled with water add 5 drops each of peppermint oil, thyme oil and citronella essential oil (dilute them first in 2 tablespoons of carrier oil). Shake well before each application and spray it on your skin to repel ticks and fleas. Note: Pets are sensitive to essential oils so this tick spray is suggested for humans only. There are some studies showing the potential use of peppermint oil as an insect repellent. One study found that peppermint oil can repel mosquitoes and kill off mosquito larvae. The peppermint oil repellent was effective for up to 2 ½ hours. (35) You can use the same tick repellent recipe using peppermint oil that was mentioned previously. Peppermint essential oil is very strong, and some people may find that it irritates their skin even when it is diluted in a carrier oil. To avoid skin sensitivities, you can dilute the essential oil with more carrier oil to create a weaker solution, or you can make your own infused peppermint oil. This oil will not be as concentrated as the peppermint essential oil, but it will still have some of its qualities. It is very easy to use peppermint to make an infused oil. For this infused peppermint oil recipe, you will need grapeseed oil, a jar with a sealable lid, and fresh peppermint leaves. Wash and dry a bunch of fresh mint leaves. Roughly chop the mint leaves and put them in a jar and lightly crush them. Warm grapeseed oil in a pan. There should be enough oil to fill the jar. When the grapeseed oil is warm, pour over the mint leaves, seal the jar and leave to cool in a dark place. The peppermint oil infusion should be ready after 24 hours. Strain the peppermint oil mixture through a cheesecloth into a clean jar. Store in a dark place until ready to use. Using peppermint oil is generally safe for most people when used in reasonable amounts. As with most essential oils, you shouldn’t put peppermint essential oil directly on your skin. Always dilute peppermint oil with a carrier oil like sweet almond oil, coconut oil, or olive oil. You can add a drop or two of food grade peppermint essential oil to 500 ml of water. You could also add a drop of food grade peppermint oil when preparing food if you want to add a minty taste to the food. Regularly consuming peppermint tea or taking non-enteric-coated peppermint oil capsules could result in mild heartburn.